so im having a hellava time getting this turbine to lay down paint flat. always has a bunch of orange peel. so my latest bright idea was to load a test panel with paint so that when I wet sand I wont burn through. I put 5 wet coats on. 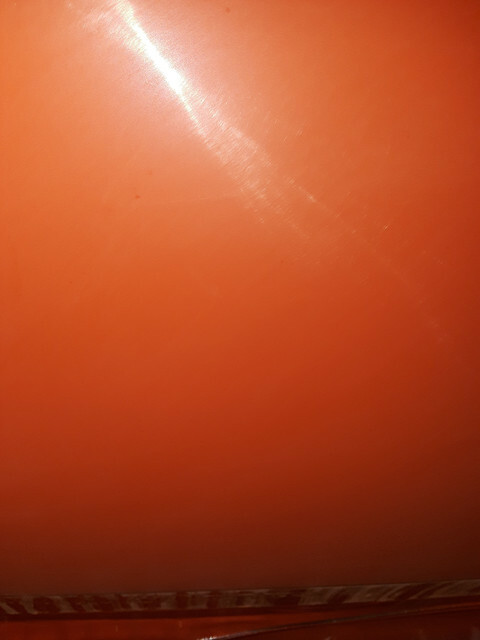 NOW there was still orange peel visible after buffing.. so I guess spraying coat after coat of orange peel is a no no? do the coats not melt into eachother? the orange peel LOOKS flat but you can still see it in the reflection. I will get pics tomorrow.. I will also try sanding a little deeper tomorrow and see what happens. 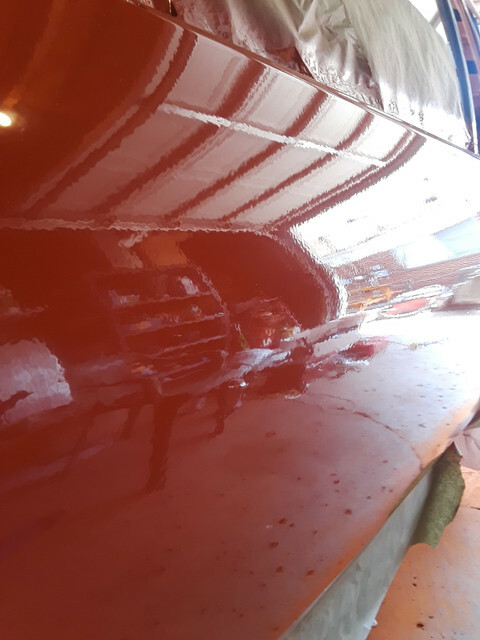 it basically looks like factory orange peel finish now,,looks pretty much like my 2018 fusion paint LOL . not exactly what I was going for.. but acceptable I guess..
You are not getting it sanded flat (no orange peel) during your initial sanding step. Did you try the twisted wool pad and a rotary buffer? 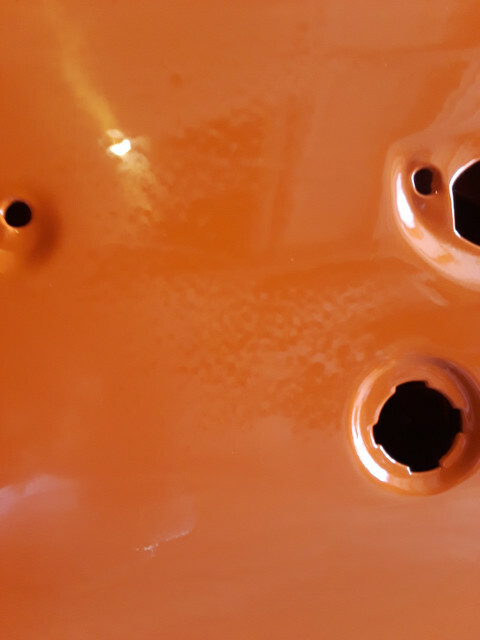 It won't take out orange peel but once you get them sanded correctly it should really make your panels have clear reflection and nice shine. 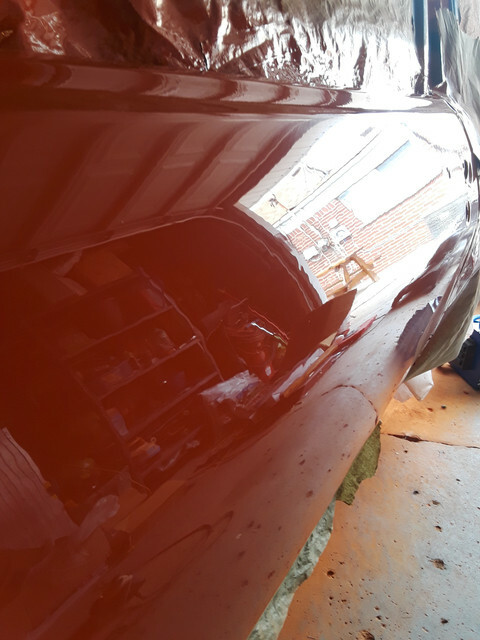 The next stages of buffing are to increase that clarity and remove any swirl marks. the twisted wool is in the mail. waiting for it to show up. im excited to give it a try. heres the mess I got myself into now haha. after spraying: OBVIOUSLY a boat load of orange peel... I just figured if I put a bunch of paint on I can sand the massive amounts of orange peel without burning through. 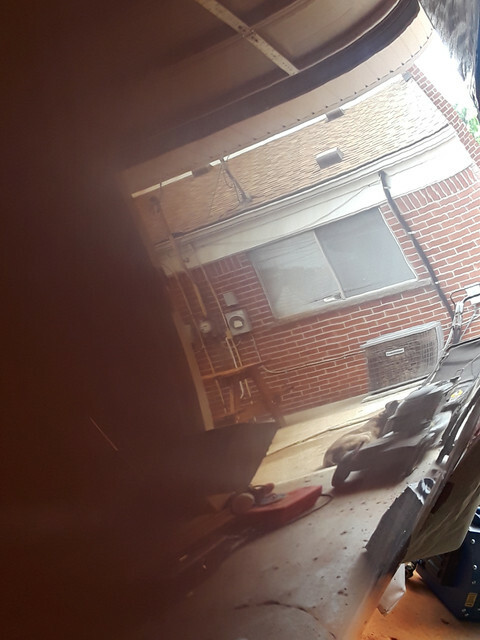 and this is how it came out... quite wavy and orange peely… you can see mostly in the left side of the garage door reflection. I only tested on the top of the panel... so today im going to try sanding deeper. it looked like the orange peel was gone but I guess not. I have been talking with experienced turbine people on how they get the paint to go down flatter so i will experiment with that aswell. are ya using sanding blocks or just putting the sandpaper in your hand? tomsteve wrote: are ya using sanding blocks or just putting the sandpaper in your hand? i am using a foam sanding block "soft sander" cut to fit the sandpaper pieces perfectly ...should i use a hard block? 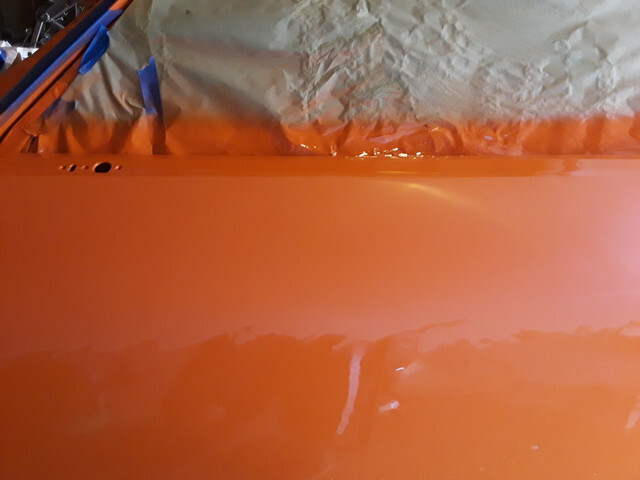 just spent way longer than any person should just working on that one spot (before putting the work in on the entire panel) went from 1000 to 3000 have NOT buffed yet. this is what i got... not a lick of orange peel on this mug (upper portion}. yet you can still see a ton of waves (orange peel-esque?) most noticeable in the roof line and bricks under the window. Any place you still see a shiny spot in your sanding process is a place the sandpaper hasn't hit. 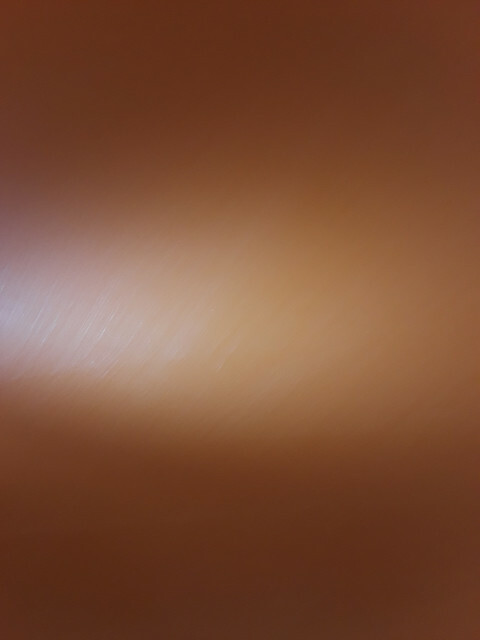 If you think of the surface as that of an orange (hence orange peel) it has lots of bumps on it. The idea is to sand those bumps level to the surrounding surface. You will not do that with too soft of a sanding block because it flexes. As stated previously I use a piece of oak for this purpose. It is flat and non flexible. i have a couple of those durablocks. to my understanding a soft block was to be used on curved panels, that's why i was using it...but what do i know? LOL anyway i spent some time yesterday using the durablock. i used 1000 and 1500 on the hard block then 2000 and 3000 with the flex block. haven't had a real good look at it yet because it was dark by the time i finished and my garage lights are awful. will be back with pics soon. Dura Block also makes a round sanding block. I use this for curved areas if the other block cannot make good contact. In fact, I don't care for the rest of the dura blocks since they tend to distort after time. I like the first one I showed for cutting with 1000 grit, the round for tight curves and the teardrop shape for those impossible areas. Other than that I use the wooden handled sanding blocks. Metal, wood, fiberglass, we work it all... www.furniturephysicians.com We can restore the irreplaceable! im happy to report: I finally have a finish I am content with. theres still small "waves" like Darrel just mentioned up there but as far as the finish goes im happy with it. i will use a hard block from now on and then use a flexible block for the super fine grits. n Darrel.. im still tweaking my turbine technique..hopefully the next go-round wont have SO MUCH orange peel. I found out where all those shallow scratches were coming from. the deeper ones were from missed scratches from the previous grit (like you guys said) the shallow ones were from not applying enough pressure... i noticed on the bowed out section of the door there were no scratches at all after buffing.. but then on either side of the bow there were a bunch of shallow scratches... i figured there was more isolated pressure on the bowed part so i slapped on a new cutting pad, m105 and put some pressure on the DA and bam.. clear finish- no scratches.... everything ive read or videos ive watched said "let the machine do the work" "don't need much pressure" "the weight of the machine is enough" which proved to be untrue in my case. i appreciate all your thoughts and experiences and preferences. im sure ill be back with some more questions later LOL but for now, i think i got it.